Stephen Colbert’s much-publicized March to Keep Fear Alive tomorrow-and his whole schtick really-may be making a far greater political impact than you consciously realize. I’m no neuroscientist, but I might even argue that the faux right-wing pundit is physically altering the very structure of your brain. Such an outlandish allegation requires a little set-up. Ready for an adventure into the political brain? The moment it hears the tone and then feels the shock, inside its head a bunch of neurons start to build a connection… Memory is a structure that connects one brain cell to another. So the next time that the rat hears that damn tone, since inside its brain tone brain cells are physically connected to shock brain cells, it’s gonna know that after this [tone sound plays] comes this [shock sound effect plays]. Instead of just listening passively, it’s gonna freeze, bracing itself for what is about to happen. Neuroscientists figured this out through experiments with the drug anisomycin, which inhibits the formation of new proteins. They found that without new proteins there can be no new memory. So when they repeated the experiment but this time gave the rats anisomycin as they played the tone (right before the shock), these rats did not react to the tone afterward. They could not learn a correlation between tone and shock, because they could not form proteins to make this experience into a memory. And then it got a little weird. What do you think would happen if instead of giving the drug while the rat was making the memory, what if, way after the fact, we gave it the drug while it was remembering the memory? Could we mess with the memory then? …Could we zap a memory that was already there? Could we go in and erase old memories? The idea was dismissed as absurd, but Nader went ahead and tested it anyway. He did the same experiment as before, playing a tone followed by an electrical charge. Then he waited 60 days. (Rats that are conditioned this way have the reaction to the tone for the rest of their lives.) Nader then played the tone, and while the rats were remembering the memory of the shock, he gave them the drug. That was the shocking result of the Nader experiment. The rat is already terrified of the shock. But if you inject the chemical as the rat is remembering what the sound means, the memory disappears. It’s as if the memory had never been there in the first place. Then they did it with people! They did a similar experiment with people suffering from Post-Traumatic Stress Disorder (PTSD). And it worked. As the patients recalled traumatic memories, they were given the drug. The next time they remembered those memories, they weren’t as painful. There really isn’t anything like a real memory. I mean, think about it… If you can erase a memory while it’s being created… and now we learned you can erase a memory while it’s being remembered-using the same drug-what that really means is that every time you’re remembering something, you’re actually recreating it. That’s the only reason the drug works. And so if you’re recreating it each time, then each time you’re remembering something it’s a brand new memory. The attacks on September 11, 2001 can be described in many horrific ways. In the language of psychology though, 9/11 was above all else deeply traumatic. The dramatic images of passenger airlines disappearing on impact into horrifically spectacular explosions; of people like us forced to jump to their deaths; of marvelously tall buildings collapsing into a lowly pile of rubble; of the symbols of the power, prestige and invincibility of our nation made vulnerable – all running as a repeating loop on our television screens – arguably made for the most synchronistically traumatizing moment in the history of our country. You may remember talking to a lot of people in the days and weeks following September 11th. When something happens that shakes our sense of safety and our picture of the world, we typically become eager to process and understand what happened. In these moments, we tend to engage in a lot more conversations – sometimes widening the circle of folks we talk with, even to include total strangers. I remember several such conversations initiated by strangers on the DC Metro. We do this in order to narrate and assimilate the unfamiliar and the traumatic into something we can explain and feel some control over; into our worldview. This is part of the process of recovering from the trauma. As we remember together, we “recreate” the traumatic events into a form that we can cope with. One of the ironies of this research is that the more you remember something, in a sense, the less accurate it becomes; the more it becomes about you and the less it becomes about what actually happened. Narrative Therapy. Therapists support patients as they focus conscious attention on traumatic events – re-imagining, re-narrating and re-membering those events. Patients actually physically change their own brains, creating new neuropathways that connect traumatic and anxiety-producing memories with more positive and empowered feelings. Then when the traumatic memories are triggered in the future, the brain activates those positive feelings and associations too, diminishing the power of the negative feelings. Bush and the neocons didn’t appear interested in healing or therapy after 9/11, but that doesn’t mean they lacked a sophisticated neurological analysis of our collective trauma. Whether consciously or just intuitively, they re-narrated the events of 9/11 to channel collective trauma and fear into widespread acceptance of an authoritarian mindset that enabled them to consolidate power and carry out an aggressive agenda. With each retelling of 9/11, Bush became a stronger and stricter father figure, who would protect and deliver us from evil and punish the evil-doers. They imbued the images of falling towers with specific meanings and emotions, neurologically fusing these memories with concepts of punishment, revenge, and blind submission to authority. While the Administration clearly understood the effect of their messaging, it’s important to recognize that it also came naturally for them. They were re-narrating 9/11 to fit and further their existing worldview, values, and agenda. They were as caught up in it as anyone, and they felt more empowered with each retelling. They had hit their stride. They were in their zone. They held the 2004 Republican National Convention in NYC, and it looked like a 9/11-themed party. Rudy Giuliani seemed incapable of uttering a sentence that didn’t reference September 11th and terrorism. Today Glenn Beck (and the base he appeals to) is so nostalgic for 9/11 that he started the “9-12 Movement” – which purports to be “designed to bring us all back to the place we were on September 12, 2001.” Who on God’s green earth would want us to be back in the place we were after such a horrible attack? People who felt empowered by the retelling, re-membering, and neurological rewiring of the events of 9/11. That’s who. Colbert’s brilliantly performed caricature of the authoritarian fear-mongering personality activates the places in our brains that actually house authoritarian fear-mongering thoughts and associations. He triggers the very same neural networks that Bush, Rove, Beck, Gingerich and company have characteristically activated. But Colbert’s satire fuses these networks with very different feelings than the anxiety and fear that actual authoritarians intend for us to feel. This may seem far-fetched, but it’s not entirely unlike the cognitive therapy methods discussed above. Colbert strips fear-based, anxiety-producing thought patterns of their potency. We can revisit and remember something as horrible as September 11th, and move from paralysis to an empowered and grounded response. Unlike Westen’s description though, Colbert isn’t inoculating preemptively. In fact, Colbert came to prominence after the Bush Administration had already shot its wad on Iraq. The Administration’s colossal failures are the main reason why more people in society built up immunity to some of their tactics. Colbert is riding that wave more than he is creating it. Nonetheless, what he’s doing – especially what he’s doing tomorrow – is making waves. The framing, “March to Keep Fear Alive” provides the perfect antidote to the so-called Tea Party on the eve of the mid-term elections. Conservative leaders are kind of one-trick ponies when it comes to fear. It’s always been their main game. So when someone like Colbert can call out all their moves – in a way that makes them a laughing stock – he’s taking some of the wind out of their sails. Of course, negatively branding the conservative narrative isn’t exactly the same thing as projecting a salient progressive narrative. 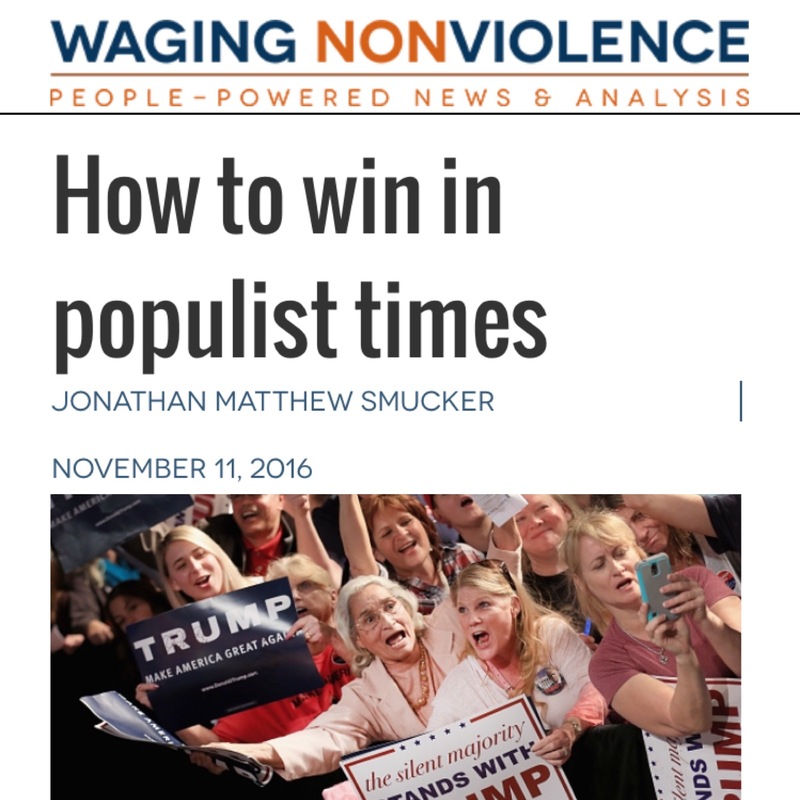 And – to point out one important problem with tomorrow’s events – a “Million Moderate March” isn’t the kind of frame that will produce the level of passion and commitment that is absolutely vital to building movements strong enough to challenge the entrenched interests that stand in the way of progressive change. Colbert can spar with the worst of our opponents – and I hope we can learn from some of his moves. But what will really rewire our neural networks on the scale we need – what will create popular positive associations with progressive social change – is the telling and constant retelling of a salient, values-based, social justice narrative. We need to figure out how to tell that better and more consistently – not just at a well-timed, well-framed, comedian-called rally before the mid-term elections, and not just during a dynamic and rare presidential campaign – until it becomes the conventional wisdom that shapes how a majority of Americans make sense of the world.